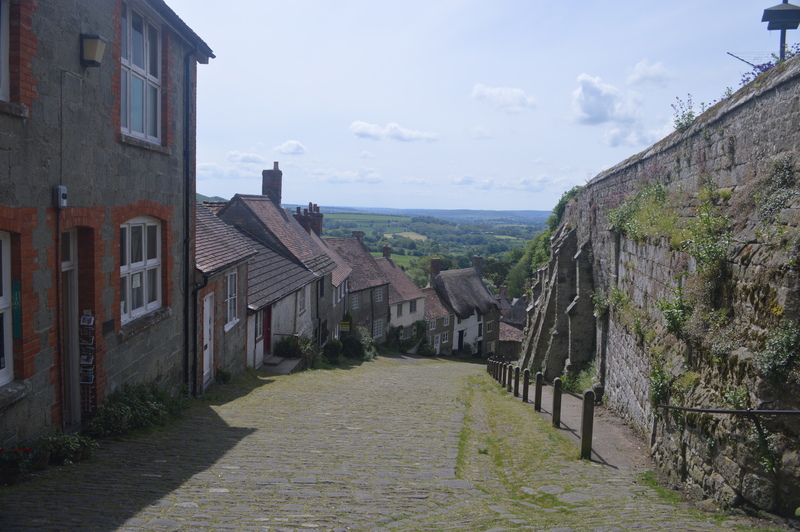 All of you know Shaftesbury, in Dorset. In the town center, just off High Street is Gold Hill. 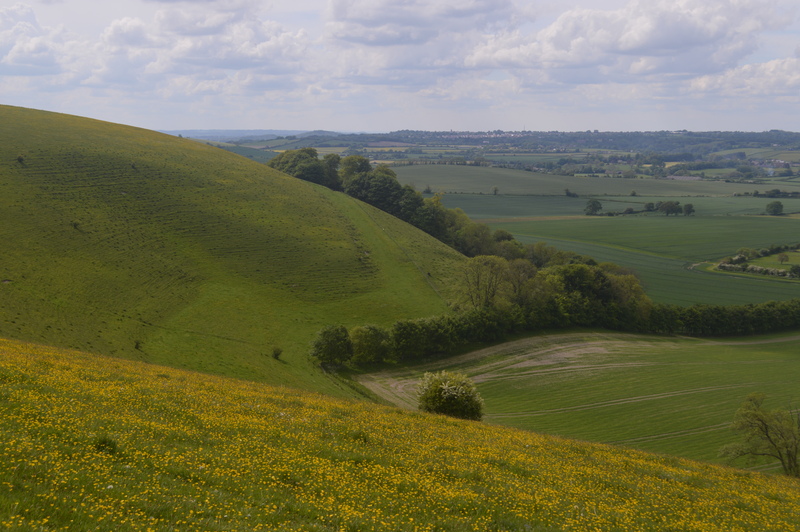 This is arguably one of the most photographed views in England. It’s on all the England calendars, Beautiful Britain books and travel brochures. It was featured in the movie “Far From the Madding Crowd”, when Terrance Stamp (young and dashing in his red officers tunic) rode down Gold Hill, passing a drop-dead beautiful Julie Christie (but galloping full speed into her heart.) I don’t know whether she was more stunning in “Madding Crowd” or as Lara, in “Dr. Zhivago”. I mean, those locks of hair the color of chestnuts (a dark blonde) that cascaded over her shoulders. Her lips? Forget about it. Full and sensual with a hint of a pout. My wife and I decided to do our first longish walk near Shaftesbury. I paid 3 pounds 60 pence for a thin guide to local walks. The maps were hand drawn and the directions had passages like “the minor road near Ludwell”. Minor road? The booklet also said that they, the authors, thought it would be impossible to get lost with this guide. Wait till they hear from my lawyer. We drove out toward Ludwell but couldn’t find the “minor road” so I stopped at a pub to ask directions. (Yes, I, a man, stopped for directions). The bartender looked, from the back, like a guy dressed in a bizarre wig for Halloween. She turned around and I saw that it was her real hair, dyed the color of…of a mix of purple, pink, red, orange and toxic neon maroon. But, she gave me perfect directions to the parking area where we would start our walk. This is in contrast with the bartender/server, back in Shaftesbury where we had lunch. She was a sweet and heartbreakingly beautiful blonde. The only problem was that bartender didn’t know the name of the street that her pub was on…or how to get to the A30, which was only yards away. So, we start our hike into a place called Ashcombe Park. Ashcombe House, was once the home of Madonna when she was married to Guy Ritchie (he still lives there). The countryside was beautiful and fragrant. I stopped to touch a Queen Anne’s Lace flower and I brushed against a small thorn. It pricked my thumb which began to throb and itch. Some small amount of toxic substance was telling me: Don’t Touch The Flowers. When I looked at the tiny thorn, I recalled Early Madonna and the perfectly conical, and razor tipped “bra” that she wore. I got the message big time. You can look but you can’t touch. Part way along the walk, I walked past a tree that had been sawed. I backed up to get a look at the tree rings. I love counting tree rings and I do so whenever I can. I made a rough estimate that the tree was about 150 years old. I tried to put a little green leaf on the rings that would mark the time of WWII. 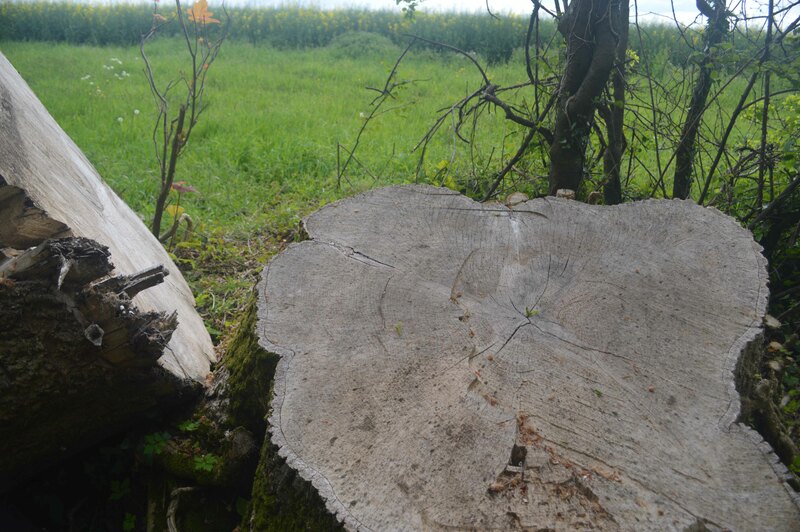 How many young men, field hands and farmers’ sons and husbands and lovers walked past that tree? The tree was a mere sapling in the year 1860 +/- , which was about 25 years after Queen Victoria ascended the throne. History was staring at me from the flat surface of a sawn tree. Like the dates on a tombstone, each ring marked an event in the life of the people who walked that little vale in Ashcombe Park. I would bet my last quid that phrase wasn’t heard too often in the fields and copses, when brave young soldiers walked home through the fields. Or when a farmer’s son, finished his chores and skipped along the hedgerow to meet his girl. 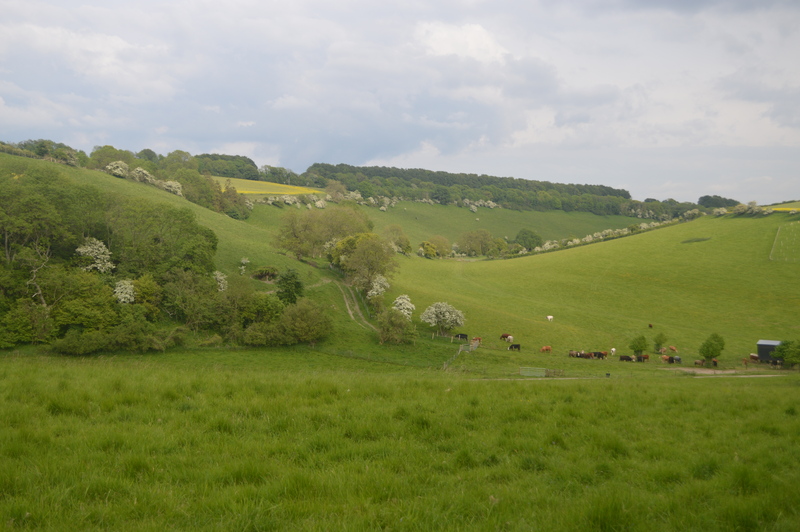 The valley of Ashcombe Park, Dorset. The wavy grey line to the left of center marks the 1940’s. The center, the 1860’s.